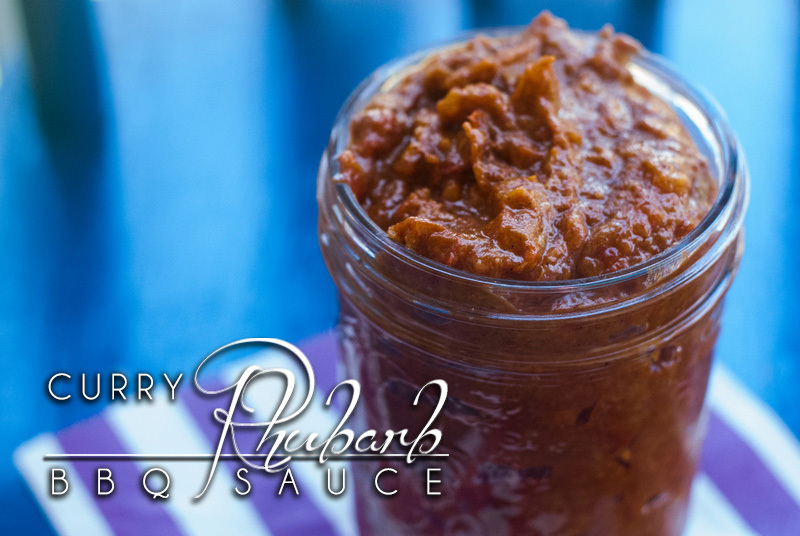 Sweet and tart fruit enhanced by fragrant spices makes this Curry Rhubarb BBQ Sauce a fun way to enhance your grilled chicken and pork. Why is it you can never grow just a little bit of rhubarb? It seems to be none or way too much. I can't remember the last time I bought rhubarb, I usually end up rescuing some, or helping out a friend. 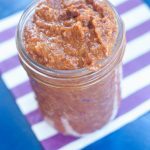 Last year we made a Rhubarb Habanero BBQ Sauce, but this one is my new favorite! Curry Rhubarb BBQ Sauce will be made by the batch, pressure canned, and enjoyed all summer long! Hi everyone, how the heck have you been? It feels like it has been a while, where have you been? Oh… It's been us that have been absent? Oh, I'm sorry. I have to be honest, I don't know what to talk about today. I have reels of ideas swimming thru my head, but I'm not sure where to start…. I have been experimenting with sourdough, but I find I forget about it and end up growing mold. It has to be fed twice a day, but unlike a child, or animal, or another human, it doesn't remind you when you forget to feed it. Those microorganisms just suffer in silence. This is frustrating because I feel like I need to teach myself how to bake killer bread before I can paleo-ize a recipe. Hard to brew and bake a perfect loaf if you are growing luxurious mold instead of bubbly happy sourdough. I am sticking close to home this weekend, it is a long weekend here in Canada. I LOVE adventures, trying new things, and seeing new places, but I am exceptionally excited to spend the weekend at home. I'm going to arrange my spare room in anticipation of summer house guests, move the cookbooks to the living room and clean out the closet. Then it's to the canning room, canning will be rotated and taken stock of, and then empty jars will be inspected and organized. Of course after all that cleaning; I'll need a nap. Then I will wash, chop and stew the 10 lbs of rescued rhubarb and make a couple batches of Curry Rhubarb BBQ Sauce and try out my new-to-me pressure canner! Maybe while I catch up on some HBO. Do you have a great show? What are your weekend plans? 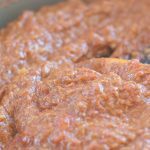 Sweet and tart fruit enhanced by fragrant spices makes this Curry Rhubarb BBQ Sauce a fun way to enhance your grilled chicken and pork. Wash and chop rhubarb, add butter and saute over medium heat. Add roma tomatoes and liquid, garlic and maple syrup, bring to a simmer. Let simmer 20 minutes and then add spices, cinnamon, cardamom, ginger, turmeric, chili flakes, salt, and cayenne. Leave garam masala aside until you are almost done, or it will overpower the sauce, alternatively if you love that garam masala add it in with the other spices. Simmer, stirring regularly, until there are no large “chunks” and the sauce becomes smooth. Add in garam masala if you haven't already. Brush onto chicken or ribs and grill to your heart's content! Secondly – I love savoury rhubarb so this BBQ speaks to me on so many levels. 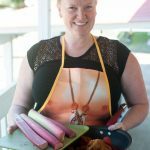 I make a gingery spicy rhubarb sauce that I can at this time of year and you have inspired me to actually get my canning stuff out of the basement and make it happen! PS. Were your tomatoes fresh or canned? I used some home canned whole tomatoes, but really 16 oz, diced canned or fresh tomatoes and juice would work! It’s nice to mix up the sweet and savory! Let us know how it goes if you try out the recipe! Happy gardening! So delicious on pork!! Have a super weekend! 10 lbs of rhubarb is a problem I’m always happy to have! And this sauce sounds like a wonderful way to use it. Your sourdough problem is something I can relate to, as well. I’ve been wanting to develop a good vegan, gluten-free sourdough that we can bake regularly for my partner and I want to start by working on a conventional one. But those starters need so much time and attention! Thank you for understanding. I feel like a failure neglecting my poor sour dough!! 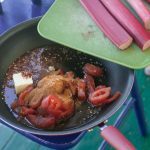 Wouldn’t have thought of including rhubarb in a bbq sauce! I just planted my own so I am on the look out for different recipes to try with it! Keep us posted on how it goes! Did you plant a large garden? This sounds great, but doesn’t give info for canning. I know the recipe is just for 1 pint but I like to make large quantities to enjoy year round. Have you tried canning it? If so, time for hot water bath? OK, have to admit I went right to the recipe — you do mention canning it, but only that you did and used a pressure cooker. Do you know the time required for hot water bath- I don’t own a pressure cooker. Have you done this before and it’s lasted safely through the winter? Hi Linda! Going straight to the recipe is okay with me. I was going to pressure can a bunch of this sauce for the year, but changed my mind. 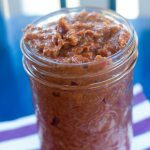 Instead I water bath canned some stewed rhubarb, so that later in the year I could make this or our https://www.theprimaldesire.com/paleo-bbq-sauce-rhubarb-habanero/ sauce. I don’t know that there would be enough acidity to waterbath can this recipe, and personally wouldn’t risk it. You can always check with http://nchfp.uga.edu/ about any questions about canning times. But again, with the spices here, I wouldn’t water bath can.